People take different roads seeking fulfillment and happiness. 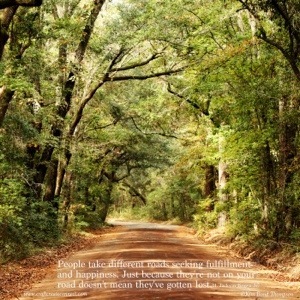 Just because they aren’t on your road doesn’t mean that they’ve gotten lost. -H.Jackson Brown, Jr.
You see, I have an annoying trait of trying to be right all the time. Being a therapist, I was put in the position to fill that need regularly as I had patients and families who needed information and I had answers. If we butted heads, I needed them to get on my path or so I often thought. After all, my path was 17 years well traveled. It was smooth in my mind and well planned. It had a Master’s Degree behind its wheels. Occasionally, I met a person who would make me get on their path. These people stand out prominently in my mind. My first ever treated patient was one of them. I was brand spanking new to my clinical when I met her. I knew a couple of things about her before I met her… I knew she had a traumatic brain injury from a heart attack. They resuscitated her for a looooong time and sure enough, she came back. I knew she had a history of violence… pinning a doctor to the wall, well off his feet in the hospital. I knew I was scared. So, I started my session with what I knew. I reached into my oh so small bag of tricks and started to assess where she was. In assessing her, I could lay out a path that was aligned with mine. Well, within 5 minutes of the session, that path was thrown out the window. She took the visual test I had placed in front of her and threw it violently across the room. She got up in my face and said “What! Do you think I am a baby? !” My supervisor calmed her down as I picked up the pieces and tried to lay them back onto the table. My rationale was that it was hard for her and that she had little awareness of what she could and could not do any more. I felt like I needed this piece of information to move forward. Within about 1 minute, she was sitting down again. These words sit in my mind even now. The realization that her memory span was that of about 1 minute completely shook me to the core. How on earth was I supposed to build a relationship with a person who was going to meet me every day for the first time? Know that movie “50 First Dates”… yup, that was my life and I was Adam Sandler. It was my job to get on her path and help her find her way. It was 1985 and it was Florida. Not married, no kids. Yup. That’s where she was in her head. Off by about 10 years. The present was lost. Gone. So, what did she like to do then? We had established table top stuff was out of the question. We played softball (eye hand coordination and balance were a major issue). We worked out (body building was part of her life at this point.) We wrote a lot down and referenced her book about what happened often. But let me tell you, its hard to use a memory book when you don’t know you have a memory problem! Her body and mind slowly healed. Then it happened… dreaded fire alarm went off as someone burned something in the working kitchen. Part of my job at that time was to check all waiting areas for patients not with clinicians. Sure enough, I found my patient standing, eyes wide open, frozen in the hallway. Her mother had gone to the bathroom. I looked up at her and told her the alarm meant we needed to leave the building and slowly lead her out. As we got outside the door, she grabbed me sternly on the shoulder. She said… “I know you! You are the one that plays games with me. We have fun together!” My only response “Yes. I am.” Somehow, despite her major challenge, we were finally on the road together. Ironically, as I have traveled down the road in life as a mom, I have once again found this path problem. Only this time, I am on one path, and my son’s special education team is seemingly on another. Insert the word “advocate” here. I am amazed now that I am “that mom,” the “child’s mother” or “that woman” as I am sure I a have been called, that the team can not see that I have traveled their paths. I was them. I am them. It has become a weird path shuffling game in my head. Get where they are… try and get them where I am. Their path is not wrong… nor is mine. But somehow for the sake of the little person, my son, we have to travel this road together or as these paths diverge in the woods… no one will be the better for it. I guess it always comes down to this… You HAVE to open your eyes, open your heart and open your mind if you wish to connect to the people around you. In work, in family, in advocating, in life. Your path is perfect for you. Mine is perfect to me… but if we are to work together for a common purpose… our paths must not diverge but rather converge into its own newly traveled path. Then we will both be the better for it. Hey… as an aside… I am going to be starting a blog/site soon with courses, e-books and lots of research and articles on all of the special needs stuff floating around in my head. If this is something that interests you, please follow me here so you will know when it launches or leave your info in the connect page of this site so that I can put you on my mailing list when I open its doors! There is just too much info in there not to share :). Thanks! I am “that mom”, too, but I’m happy that my daughter’s “team” is very open to hearing what I have to say. I think I am very fortunate. This truly spoke to me. How you put it is perfect, thankyou for sharing your thoughts. I have a son who has special needs and we just moved, i fianly felt like everyone on his team at our last home was finally on the same path for him. Now we are starting over trying to see where this new team is at and go from there. Seeing this from a profesionals stand point as well as a motherwho has a child with special needs was wonderful thank you! You are very welcome. Thanks for reading and your comment!